The Hon. Jean Augustine, Secretary of State for Women, has announced that Akaash Maharaj has been awarded the Queen’s Golden Jubilee Medal in recognition of his work in Canada towards peace in the Middle East, in his capacity as President and CEO of the Concordis Foundation. The Queen’s Golden Jubilee Medal was struck to commemorate the 50th anniversary of HM Queen Elizabeth II’s accession to the throne, to honour “Canadians who have made a significant contribution to their fellow citizens, their community, or to Canada.” The medal is part of Canada’s National Honours System. 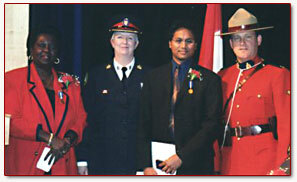 Secretary of State Augustine presented Akaash with the medal at a ceremony for recipients in Etobicoke.